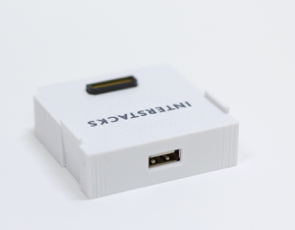 The Interstacks USB Keyboard/Mouse hardware block lets you connect a USB keyboard or mouse to your stack. It can also interface with many USB touch panels integrated into displays. Simply plug a USB Keyboard into the USB Host connector on the back of the block and type a key. A message with the character that was typed will be sent out the “Keyboard” output terminal. It is also possible to do advanced keyboard, mouse, and touch panel event handling via the “Raw Event” output terminals (see details in specification data below). To set properties in Stackbuilder: Select the Keyboard block by clicking on it once. Click in the “Property Editor” in the bottom right, in the “Initial Value” column for the property you want to edit (if a character or string, use quotes). Device (int): Number indicating what is connected to USB port. Read only. 0x00 Nothing, 0x01 Hub, 0x02 Keyboard, 0x04 Mouse, 0x08 Vendor specific HID device e.g. Touch Panel, 0x10 FTDI serial. Mouse_mode (int): Mouse mode. If 0, waits for request before sending mouse data. if > 1, sends continuously. if 1, just sends one mouse position. FTDI_Baud (int): FTDI baud rate. Mouse_Rate (int): Raw mouse report rate, in mouse samples, default=100. Only affects raw mouse output. Touch_Rate (int): Raw touch report rate, in touch samples, default=100. Only affects raw mouse output. “Keyboard” – out (character string): Send processed keyboard character. String of length 1. “Mouse” – out (list [‘X’ or ‘Y’, int ]): send relative x,y mouse position data. One char string “X”, int. or “Y”, int. “Mouse Buttons” – out (character string) “0”-“7” mouse buttons. “0” if released and none. sends on state change. Universal spec for mouse buttons is bits are ORed together. Left is 1, right is 2, middle is 4, left and right 3, all 3 pressed is 7. “Raw Keyboard Events” – out (int): outputs a 4 byte, packed int for keyboard events.